Sometimes things happen in my life that are so confusing, they set me back for days. I went to my local Walmart on Sunday. Yes, this indicates a definite lack of planning on my part, but that’s not the story. As I was getting out of my car, I noticed something on the ground behind the next car over. I walked back there to make sure it wasn’t something sharp, and there I found it. 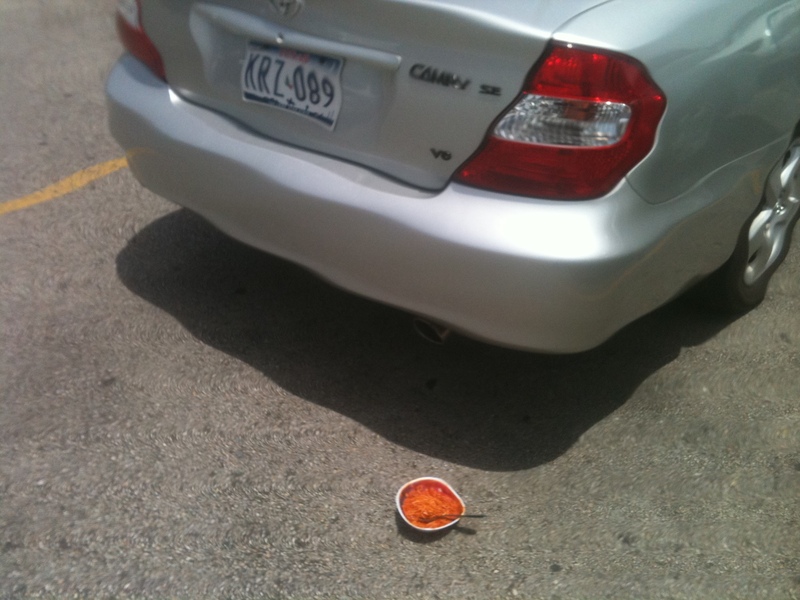 It’s 1:00 pm on a Sunday afternoon in a Walmart parking lot, and there’s a plastic bowl of spaghetti with a metal spoon in it sitting on the concrete directly behind this car. My mind is officially blown. I was so confused, I forgot what I was there to shop for. Did they put it there themselves? Is that how they heat up their lunch while they shop? Were they driving around eating spaghetti in their car, and didn’t want to take it in the store with them, but couldn’t leave it inside the car because that’s where they keep their dogs? Maybe they weren’t even aware it was there, and it had been placed there by someone else. Perhaps that’s some way of marking them for death from the Mafia. Did this family anger the Boyardee Mob, and now they’re paying the price? I stayed in the parking lot for a while, hoping to see them come back out. I eventually went inside, grabbed my purchases and rushed back out to see what happened. But the car was gone. And so was the bowl of spaghetti. There wasn’t a broken bowl left behind, nor was there a drop spilled in the parking lot. It looked like it had been rescued. And so, I’ll never get any answers, and I’ll just keep wandering around wondering what happened. This is why I can’t focus on anything important these days. I’ve got too many unanswered questions left in my head. — Reid Kerr wishes he made enough money to only shop at Target. This entry was posted on Sunday, June 2nd, 2013 at 2:53 pm	and is filed under Musings. The entry is tagged under comedy, humor, spaghetti, Walmart. You can follow any responses to this entry through the RSS 2.0 feed. You can skip to the end and leave a response. Pinging is currently not allowed.